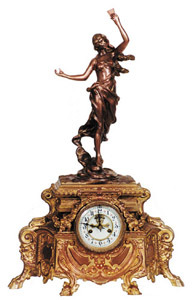 Waterbury Clock Co. metal statue case, "Duchess", ca 1905. Originally a rich gold plate, base retains 2/3 of gold, statue is wearing to the copper undercoat. 28 inches high, statue held by 2 pegs. A lot of detail cast into the base, double rams feet on each back leg, sea serpents as feet in front, profile of god on each end, rope of flowers around the bezel, and many other objects. Heavy case bezel, beveled glass, 2 piece porcelain dial with open escapement, all good. Correct pendulum. Ly-Waterbury No.1245. Note, almost identical, except for scarf in her hands and the position of her right arm. This lady is original, never held a scarf. Designs cast into the back also. It has a back door. 8 day movement, rack and snail strike, half hour and hour. Runs but will need some adjusting. Original signed key, correct bob.